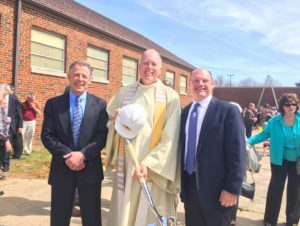 On Sunday, April 12, 2015 St. Joseph Parish parishioners brought shovels to the ground to symbolize the beginning of construction for the new family center and gymnasium. The construction of this 14,000-square-foot building will begin next month under the management of Panzica Construction Company. Since 1995, St. Joseph parishioners have doubled to 6,000 members. In 2000 a new church was built and to accommodate the growing parish, the fundraising campaign for the $2.1 million family center and gymnasium began in 2011. Among the activities at the center will be meals, plays, worship activities, basketball and volleyball games. Terry Scott (Project Superintendent – PCC), Rev. Ron Wearsch (St. Joseph Catholic Parish), Mark Panzica (Executive VP, PCC) at the groundbreaking, Sunday April 12.